Can you put a scope on a muzzleloader? The answer is absolutely yes! If you can put a scope on a shotgun, then you certainly can put one on a muzzleloader. You would probably want one to help improve your accuracy if you’re hunting with a muzzleloader. So, what are some of the best muzzleloader scopes? Let’s explore our top five so you can get a good idea of what type of scope would be needed for your muzzleloader. Many people think, or have thought (myself included) that you can’t scope a muzzleloader rifle because the recoil is so severe that surely it will tear up that pretty new optic. Well, while an improper mount may have that effect, generally speaking scopes are made to withstand this kind of abuse and shouldn’t be overly injured just from recoil alone. The recoil from a muzzleloader is a bit more severe than say a 30-30, but it’s generally no worse than a shotgun blast and people scope shotguns all the time. There are a few factors that can cut back on this recoil effect. The heavier the gun, the less recoil. If your muzzleloader is heavy to cut recoil, then choosing the lightest scope you can make sense when thinking about hunting in the field all day. Using a 200 or 150-grain load as opposed to a 300-grain load will help cut back on recoil. The lighter load of less explosion power equals less kick back. Some of your propellants won’t convert completely to gas, making for more drag, as it is another solid being forced through the barrel, is heavier, and therefore causes more recoil. Traditional black powder can be substituted with Pyrodex or other such substitutes that convert more completely to gas when ignited. Parallax is the distance that you can hold the scope away from your face and still get a full image view. You would want at least a three-inch parallax, but for muzzleloader recoil, would really want to be as far as possible so you don’t crack yourself in the face with your scope. A five to six-inch parallax would be magic. This is why many people opt for a reflex sight. A muzzleloader is not the gun you want to go crazy over with the magnification. You will more than likely only be shooting a maximum distance of 300 yards, but more realistically in the 150-yard range. A 1x to 4x powered scope would be more than sufficient to achieve this. A variable powered scope is a great option, but with the shooting distance of a muzzleloader rifle, a 3x or 4x fixed powered scope would probably be all you ever needed. For a muzzleloader, I personally would go with a bullet drop compensating (BDC) reticle. This type of reticle estimates your bullet drop at certain distances and has a maximum effective range of 300 yards before it starts losing accuracy. If not a BDC, then a good Mil dot reticle or hash mark reticle that can estimate drop distance would be beneficial. There is a lot of handling that goes with a muzzleloader rifle. Every shot has to be individually loaded into the barrel with a rod. Between this and general gun maintenance, you may consider specialized scope rings, like quick release rings. These can be quickly released with a lever, and just as quickly re-attached without losing zero. If not, be sure to tighten your mounts fully down using blue Loctite, as this will lock your screws in place, but not permanently so they can be removed later. Using red Loctite will lock in permanently, so don’t use this one. Related Read: How to measure scope ring height. The compact, rugged Crossfire II 1x Muzzleloader scope satisfies "no magnification" rules and provides a crystal-clear and ultra-bright unmagnified view. With generous 3.8 inches of eye relief and a vast, 95-foot field of view at 100 yards, the fully multi-coated optics and V-Plex reticle assure accurate shot placement in low light conditions. The fast focus eyepiece allows quick and easy reticle focusing. The Vortex Crossfire II 1×24 Muzzleloader Riflescope is constructed of a single piece, one-inch tube diameter aircraft-grade aluminum for strength and rigidity, and is waterproof. The crystal clear glass lenses are fully multi-coated with multiple anti-reflective coatings on all air-to-glass surfaces to increase light transmission. This scope has a second focal plane V-plex crosshair reticle to assure accurate shot placement in low light conditions, and a generous 3.8 inches of eye relief. The 1x magnification means no magnification, so you will get a nice clear and bright view of your target while staying compliant with no magnification rules during special hunts. Plus, it comes with the Vortex lifetime warranty. Customers of this scope are pleased with its performance and love the bright, clear and easy to focus optics, and how lightweight and compact the overall scope is. Well-made and rugged, people say that the reticle holds very well and makes accurate shots. Negative remarks for this product were inconsistent and isolated. The Traditions Performance Firearms Muzzleloader Hunter Series Scope is a 3.4-10×44 powered scope that is nitrogen filled for a waterproof, fog proof and shockproof design. The multi-coated crystal lenses provide an increased clarity, even in low-light conditions and also provide a three-inch eye relief with a rubber fast-focus eyepiece. This neat little scope is compact and comes with a range-finding BDC reticle, and ¼ inch MOA windage and elevation adjustment turrets. The reticle lines measure in 50-yard increments for easy range estimation. You will want to mount this scope with high scope rings, between ¾ inch and ½ inch high. Customers who use this scope say that it is incredibly accurate, shooting dead-on hits at between 100 and 150 yards. They compliment clear, high-quality glass and the BDC reticle. Customers also tend to like the quality for the price. Some customers have reported that the BDC measurements are inaccurate and have also complained about the glass being blurry in isolated reviews. The Nikon INLINE XR BDC 300 has a unique, Nikon patented open circle designed reticle that makes long-range shots easier. The fully multi-coated optics produce maximum brightness and light transmission for ultimate dawn to dusk image viewing. 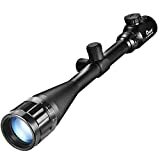 One of the greatest features, in my opinion, is the consistent five-inch eye relief throughout the entire magnification range that protects your brow against even the toughest recoil assault. This compact little beauty comes in three different colors, matte black, silver and Xtra green finish, depending on your preference. Other great features include a quick-focus eyepiece, precision ¼ inch adjustments on spring-loaded instant-reset turrets, and Nikon’s Spot On Ballistic Match Technology. Plus, it only weighs 14.7 ounces. Fans of this scope absolutely love the optical clarity and the awesome eye relief. Many agree that the Spot On Ballistic Match Technology is a very valuable feature, and the BDC reticle lines up nicely. Perfect for a muzzleloader and since it stands up to the recoil, great for other rifles too! One of the biggest complaints about this scope is that the field of view is terrible, as it is extremely narrow. The CVLIFE Hunting Rifle Scope is a 6-24x power magnification scope with a 50mm objective diameter. This features an AOE (Adjustable Objective) red and green illuminated Mil dot, range-finder style reticle, 3.52-inch eye relief, and 1/8 inch per 100 yards click value adjustment turrets. Both red and green reticles adjust to 5 levels of illumination. Bonus items included with this scope are a CR2032 battery for the electronic reticle, a lens cover, and a pair of see-through scope mounts for a 20mm Weaver dovetail rail. Most customers hands down agree that this is an amazing scope for the money. They are reporting that the glass and reticle quality rival that of some of the very high-dollar scopes and that it doesn’t fog up in any weather condition. One person stated that the illuminated reticle is an optional feature, simply adding light for low light conditions to an existing reticle that reflects the light. So this scope is still functional if the batteries die, which is fantastic! Complaints about this scope are varied. Most complain that the sight is blurry and that it has a hard time holding zero. Others state that it is difficult to adjust or that the adjustments just don’t work. The Ohuhu Hunting Rifle Scope features a 6-24x magnifying capability with a 50mm diameter objective lens for vivid clarity and unrivaled accuracy. The tactical AOE illuminated Mil dot reticle allows you to switch between red and green illumination, giving you the upper hand when it comes to night hunting or low light conditions. It has a nice, wide field of view of 28 feet at 100 yards and click value adjustments of 1/8 inch at 100 yards. The Ohuhu is incredibly durable and rugged. The hard anodized aluminum alloy exterior is 100% nitrogen purged for a slick, fog proof, water and shockproof design. On top of all this, this is a super budget friendly scope, and if that weren’t enough, it comes with a pair of Picatinny rail rings for a 20mm Weaver dovetail rail. Most people are very impressed with this scope’s quality and performance for the money. Most agree that the glass is clear and bright and great for low light conditions. Some have mentioned that though it’s a big scope, it’s not overly heavy. There seems to be quite a few complaints about this scope. First, apparently, the illumination is so bright it emits a distracting glare. Second, it seems people are having trouble holding zero and losing the reticle after a few hundred rounds. It seems it also doesn’t like to adjust after these few hundred rounds as well. What does AOE stand for? – AOE stands for Adjustable Objective. The E is alluding to the electronic quality, as in an illuminated reticle. Is muzzleloader recoil too much for a scope? – Not necessarily. Most scopes are built to withstand a large recoil. Some of the recoil from a 30-06 or shotgun would be similar to that of a muzzleloader. As long as you’re getting the correct type of scope for your gun and mounting it properly, it should have no problem surviving the recoil. Why would I want a scope on a muzzleloader at all if hunting restrictions include no magnification requirements? – The scope with no magnification at this point would be considered a sight. Benefits would include a clear, better-lighted view of your target. This would be for adverse weather conditions or low light conditions. Being able to put a reticle on target is a pretty nice option. Hopefully, this guide has helped you to discover and learn a bit about what would be some of the best muzzleloader scopes. These are fun guns, so have fun shooting! If you enjoyed this article you might like to read our article on scopes for the Marlin 336 or how to sight in shotgun scopes.